Who in the World is Prim Fritter? I believe I may have mentioned that I’m a tad obsessed with iPad games. I blame my older daughter. She put Magic Piano on my iPad mini while my back was turned. Now I have to check it every day to see what the new song is. Then I have to play the new song. There’s a new free song every day. How can I resist that? Of course, there are also plenty of songs that cost game currency, which one can earn by watching ads. I’ll admit it; I have watched a few ads. Okay, a lot of ads. I needed the Smoola to get more songs. One can also spend real money, but I have resisted that temptation. So far. My daughter also introduced me to hidden object games. I have five of them now. I found a couple of them on my own. Yes, they were advertised on Magic Piano. My daughter set me up with the best one, Mirrors of Albion. She became my friend on that game and she showed me how to make other friends. I now have one hundred and fourteen friends. She has over two hundred. She is the only one of my friends I actually know personally. It doesn’t matter. We all give each other gifts. We can give fifty gifts each day. Why would you need two hundred friends if you can only give fifty gifts a day? Sometimes, your friends go to sleep. It means they haven’t played in a while. If they’re asleep, you can’t exchange gifts with them. Gift-giving is fun and it helps you move the game along without spending real money, so it’s good to have plenty of back-up friends. Then there’s My Singing Monsters. This is an adorable game. It’s hard to explain the appeal. It has islands and it has monsters that sing and the monsters are all really cute. Each kind of monster sings a different part of each island’s song. The more different monsters you add to your island, the more complex the song becomes. My daughter has actually spent a little bit of real money on this game, but I’m still resisting. For now, anyway. I’m a word junkie (can you tell?) so I have to play Words With Friends. My daughter and I have several games going at the moment. I can always tell when my daughter wants to send me a message on my iPad. First, she’ll take her turn on Words With Friends to get my attention. Once I take my turn, she knows I’m looking at the iPad and she sends me her message. I don’t have a smart phone, so this is as close as I get to texting. My daughter also got me hooked on My Little Pony. An evil pony has destroyed Ponyville and we need to rebuild it. We add ponies. We add shops. We put the ponies to work in the shops and collect game currency (bits) so we can buy more ponies and shops. There are mini-games within the game and one of them involves dancing ponies. You get more points if you have other ponies dancing with you and that’s why my daughter signed me up. She had a game on her iPad under one character name and a game on her iPhone under another character name, but that only gave her one other pony to dance with, and the game will let you dance with two other ponies. She needed another pony, and now she has Releaf 60. I am not Prim Fritter. I do not know anyone named Prim Fritter. Today I’m Releaf 60 again, but I’m still curious about Prim Fritter. Do I have an alter-ego? A doppelganger? Who is this Prim Fritter and why was she taking my place on the Leaderboard? It’s a pony-sounding name, so I suspect it may be a placeholder of some kind, but I don’t really want to know. I’d rather enjoy the mystery. This entry was posted in Uncategorized and tagged app games, Magic Piano, Mirrors of Albion, My Little Pony, My Singing Monsters, Prim Fritter, Words With Friends on October 8, 2014 by releaf1954. My regular followers might be wondering if I’m ever going to paint again. It’s my goal for this blog year to paint fifty paintings. I got a good start and kept up a fairly steady pace until the Orange incident. I didn’t think I would let that discourage me from painting, but somehow, I’ve let six weeks go by and I haven’t opened up a tube of paint. Until tonight. I knew I had to get back on that horse and I knew today was blog day. I thought it would be nice to be able to blog about a new painting. I started looking around for something to paint. I went through all the photographs on my iPad. That would have been more helpful if there were no games on my iPad. I’ve lost count of the number of “Words With Friends” games I am playing with my daughter, but I seem to want to stare at every single one of them until I figure out how to make the perfect seven-or-eight letter word on a Triple Word space. This has only really happened once, but that doesn’t stop me from trying. I made some good words, I worked on rebuilding Springfield on the Simpson’s game, “Tapped Out,” I hatched some cute monsters on “My Singing Monsters,” I picked up some coins on “My Little Pony,” and I found dozens of hidden objects on six or seven different games. I tried out the new song on “Magic Piano,” too. I did a lot of things, but I did not find a photograph that appealed to me as a painting reference. The only one that ever did had already led to the aforementioned Orange incident. Orange. I picked one up anyway. I took it to my painting space (otherwise known as the dining room table) and I put it on a piece of bright turquoise cloth. 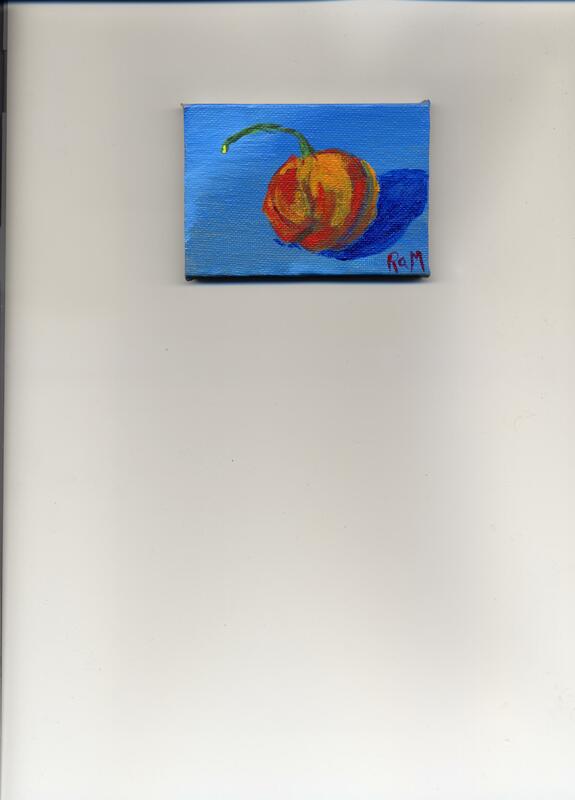 I took out a tiny canvas and I painted. I didn’t prepare. I didn’t sketch. I just painted. It’s itty bitty, but it’s a painting. It counts. This entry was posted in Uncategorized and tagged iPad games, Magic Piano, My Singing Monsters, painting, Words With Friends on September 3, 2014 by releaf1954.